COME AND BE CHARMED BY THE OVERSIZED OUTDOOR LIVING AND RARE TWO-LEVEL APARTMENT WITH STUNNING VIEWS! Be impressed the minute you walk into this stunning multi-level 2bed, 2bath residence overlooking leafy Taringa & Indooroopilly. This light-filled apartment with its soaring ceilings has a certain panche & style about it. The massive balcony area which stands alone (with aluminium privacy shutters) gives you the feeling you are the only one living in this lifestyle apartment. It has a bedroom on each level + a sunroom area from the lower level bedroom & a purpose built study alcove on the upper level of the apartment. This house-sized property provides a superb vantage point for you to experience all the benefits of Swann Road living. Less than a one minute walk to Swann Road Bus connections and your favourite inner-west destinations. 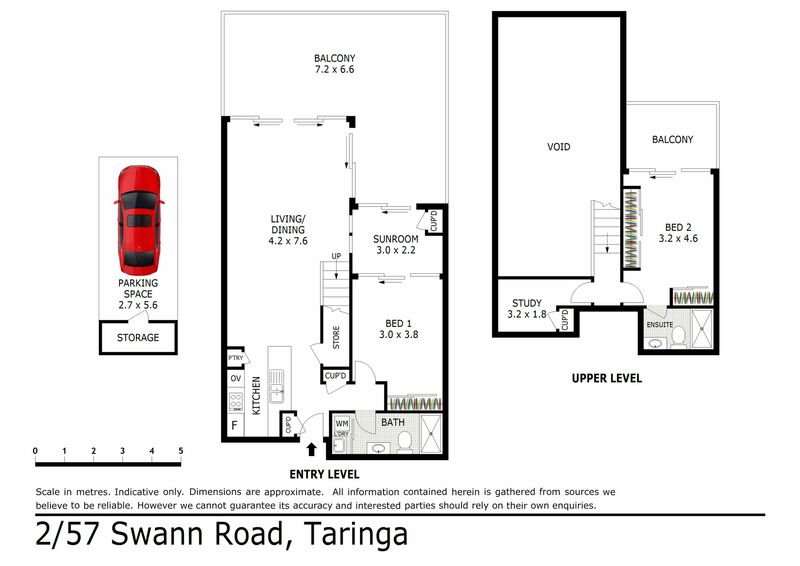 Taringa Train Station is only 325m away and allows you to easily join friends for that big match at Suncorp Stadium or onto the City for an evening dinner. You are a quick three minute drive to the Indooroopilly Shopping Precinct. Leafy manicured grounds, dual access from Central Avenue secure car parking underneath the lifestyle complex that has the added benefits of a gym, pool & BBQ areas + the ongoing care by the ’57 Swann Road’ body corporate, who do a great job maintaining the building and surrounds. This blue ribbon address will deliver the premium lifestyle you have been dreaming of, don’t waste another minute – view the property today!